This walk: 2013-11-27. Sherberton Farm, apiary, bees, logs, bridge, planks, sheep creep, buzzard, stone circle, Galloway cattle, tors, Dunnabridge Pound, John Bishop's House, TA stone, Higher Swincombe Farm, grinding stone supports stones, Swincombe Ford Bridge, stepping stones, Gobbett Mine crazing mill, blowing house, mould stone, mortar stones, buddles, wheel-pit, adit, Forest Inn, Queen Victoria's Cross. Link to PAGE 2 of this walk. Similar walks were done in this area on 18 April 2007 (see section towards the end of the walk) and 22 July 2009. Gobbet Mine gert, from the 19th Century. 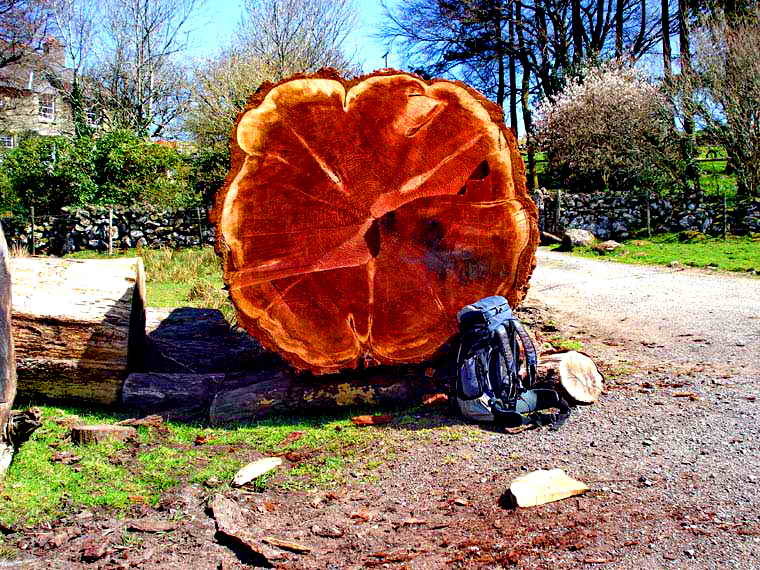 > Another view - I counted precisely 100 annual rings, although there may have been another at the bark. Road bridge over the river Swincombe - an old clapper bridge with parapets added, similar to Leather Tor Bridge and a few others. Part of Sherberton Farm, an Ancient Tenement of Dartmoor, one of several very old, possibly originally Saxon, settlements, from the 1300s or possibly earlier. Also see Legendary Dartmoor's The Ancient Tenements web page. I'm calling this "Anton's Tor" - he sells granite moorstone for various purposes. Sheep creep at SX 64406 73339. Hold on at the front, Chris, you're going to spook that buzzard! The bird settled again not far away. Image © J Butler 1993. Reproduced by kind permission (ref. 29 Sept. 2012). The circle is described in J. Butler (1993), Atlas of Dartmoor Antiquities IV, The South East. 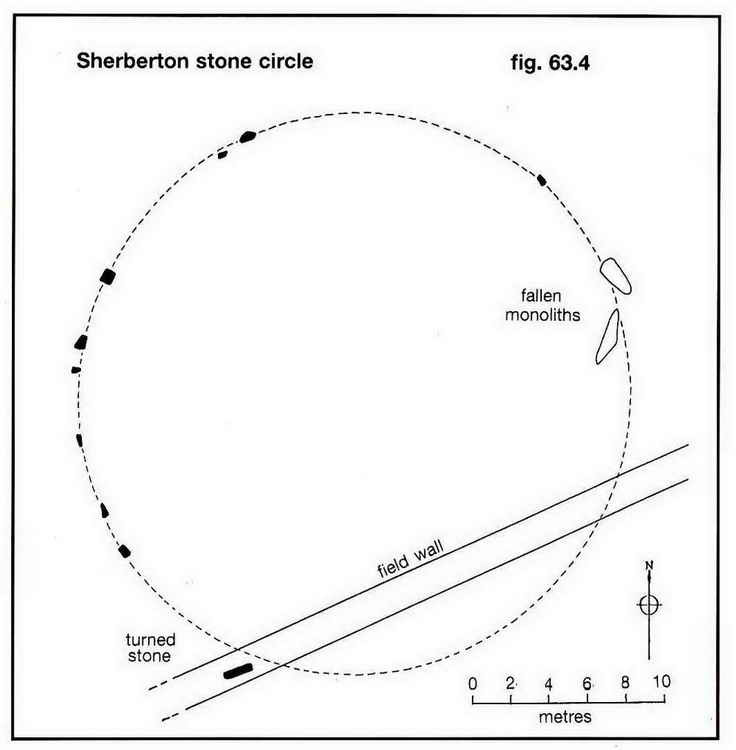 63.9 Sherberton stone circle, pages 217-218. View to Bellever Tor, at SX 644 764, elevation 443 metres (1453 feet). Fox Tor, SX 62613 69820 � 3 metres, elevation 438 metres (1436 feet), near Foxtor Mire. Laughter Tor, SX 65253 75695, elevation 420 metres (1377 feet), with Dunnabridge pound in the foregraund. Higher White Tor, SX 619 785, elevation527 metres (1728 feet). Longaford Tor (left) and Higher White Tor (right). John Bishop's House, visited later. The "A" facing the terminal town (Ashburton) is clearly seen on this face: the other face is more difficult to see ...... SX 63989 72612. By special request, just for one of us, click here. Nearby trees, looking skeletal in winter conditions. Close-up, although in reality the knife would have been turned 90� across the much bigger stone. Zoomed view to a dead tree. John Bishop's House ..... seen from the entrance gate? John Bishop's House ..... the front door and porch - note the massive roof to the porch.